This article explains how to select important variables using boruta package in R. Variable Selection is an important step in a predictive modeling project. It is also called 'Feature Selection'. Every private and public agency has started tracking data and collecting information of various attributes. It results to access to too many predictors for a predictive model. But not every variable is important for prediction of a particular task. Hence it is essential to identify important variables and remove redundant variables. Before building a predictive model, it is generally not know the exact list of important variable which returns accurate and robust model. There are a lot of packages for feature selection in R. The question arises " What makes boruta package so special". See the following reasons to use boruta package for feature selection. Perform shuffling of predictors' values and join them with the original predictors and then build random forest on the merged dataset. 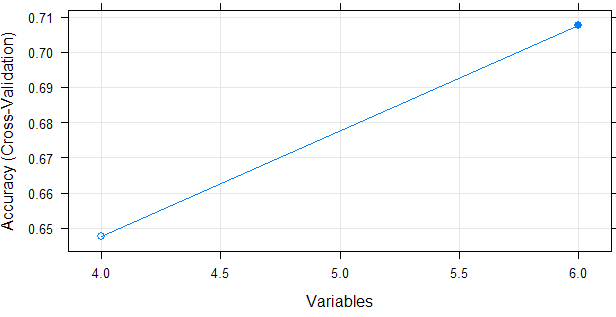 Then make comparison of original variables with the randomised variables to measure variable importance. Only variables having higher importance than that of the randomised variables are considered important. Tag the variables as 'unimportant' when they have importance significantly lower than MZSA. Then we permanently remove them from the process. Tag the variables as 'important' when they have importance significantly higher than MZSA. Repeat the above steps for predefined number of iterations (random forest runs), or until all attributes are either tagged 'unimportant' or 'important', whichever comes first. When i first learnt this algorithm, this question 'RF importance measure vs. Boruta' made me puzzled for hours. After reading a lot about it, I figured out the exact difference between these two variable selection algorithms. What is shuffled feature or permuted copies? The read.csv() function is used to read data from CSV and import it into R environment. Result : "admit" "gre" "gpa" "rank"
No missing values in the dataframe df. In this dataset, we have no missing values. If it exists in your dataset, you need to impute them before implementing boruta package. Boruta performed 9 iterations in 4.870027 secs. It shows all the three variables are considered important and no one is tagged 'unimportant'. The plot() option shows box plot of all the attributes plus minimum, average and max shadow score. Variables having boxplot in green shows all predictors are important. If boxplots are in red, it shows they are rejected. And yellow color of box plot indicates they are tentative. Tentative Attributes refers to importance score so close to their best shadow attributes that Boruta is unable to decide in default number of random forest runs. As you can see above the label of shadowMean is not displayed as it got truncated due to insufficient space. To fix this problem, run the following program. It is to check whether boruta package will be able to find unimportant variables or not. In the following program, we have created duplicate copies of the original 3 variables and then randomise the order of values in these variables. Boruta performed 55 iterations in 21.79995 secs. The irrelevant variable we added to the dataset came out unimportant as per boruta algorithm. To save a final list of important variables in a vector, use getSelectedAttributes() function. Incase you get tentative attributes in your dataset, you need to treat them. In this dataset, we did not get any one. When you run the following function, it will compare the median Z score of the variables with the median Z score of the best shadow attribute and then make a decision whether an attribute should be confirmed or rejected. maxRuns: maximal number of random forest runs. Default is 100.
doTrace: It refers to verbosity level. 0 means no tracing. 1 means reporting attribute decision as soon as it is cleared. 2 means all of 1 plus reporting each iteration. Default is 0.
getImp : function used to obtain attribute importance. The default is getImpRfZ, which runs random forest from the ranger package and gathers Z-scores of mean decrease accuracy measure. holdHistory: The full history of importance runs is stored if set to TRUE (Default). Fit the model using all independent variables. Calculate variable importance of all the variables. Each independent variable is ranked using its importance to the model. Drop the weakest variable (worst ranked) and builds a model using the remaining variables and calculate model accuracy. Repeat step 4 until all variables are used. Variables are then ranked according to when they were dropped. For regression, RMSE and R-Squared are used as a metrics. For classification, it is 'Accuracy' and 'Kappa'. In the code below, we are building a random forest model in RFE algorithm. The function 'rfFuncs' denotes for random forest. In this case, RFE algorithm returned all the variables based on model accuracy. As compared to RFE, boruta final variables make more sense in terms of interpretation. It all depends on data and its variables' distribution. As an analyst, we should explore both the techniques and see which one works better for the dataset. There are many packages in R for variable selection. Every technique has pros and cons. Multicollinearity means high correlation between independent variables. It is an important assumption in linear and logistic regression model. It makes coefficients (or estimates) more biased. Lets's check whether boruta algorithm takes care of it. Let's create some sample data. In this case, we are creating 3 predictors x1-x3 and target variable y. The correlation of variables x2 and x3 is very high (close to 0.9). It means they are highly correlated. Boruta performed 9 iterations in 7.088029 secs. Boruta considered both highly correlated variables to be important. It implies it does not treat collinearity while selecting important variables. It is because of the way algorithm works. Impute missing values - Make sure missing or blank values are filled up before running boruta algorithm. Collinearity - It is important to handle collinearity after getting important variables from boruta. Slow Speed - It is slow in terms of speed as compared to other traditional feature selection algorithms. 6 Responses to "Feature Selection : Select Important Variables with Boruta Package"
Very Useful data about this new trend topic, this is good for each studying and expertise. And additionally these days I was attempting to find best essay writing service reviews have quite a few right key points and I discover ways to write essays and get right of entry to it. I think which covers each and every points concerning with essay writing and which makes it greater powerful and beneficial reference for the me. Awesome Post! Boruta is an easy to use package as there aren’t many parameters to tune / remember. You shouldn’t use a data set with missing values to check important variables using Boruta. How to implement this in SAS?